Tamarindo, Costa Rica, March 13th, 2015, Jogi – Juergen Gerner of ABC Real Estate has joined the National Association of REALTORS® (NAR), connecting to a worldwide network of more than one million trusted real estate practitioners. Only members of the National Association of REALTORS® are properly called REALTORS®, and they are identifiable by the REALTOR® “R” logo on their marketing and sales literature. By joining NAR, Jogi has aligned with the most trusted name in real estate. REALTORS® are required to abide by a strict code of ethics, obligating them to client loyalty; fiduciary (legal) duty to clients; cooperation with competitors; truthfulness in statements and advertising; and non-interference in exclusive relationships that other REALTORS® have with their clients. They are expected to maintain a higher level of knowledge of the process of buying and selling real estate. Working with a REALTOR® provides buyers and sellers with confidence that their real estate professional is knowledgeable and trusted. Jogi Juergen Gerner has a connection to over one million REALTORS® in over 50 countries around the world to assist with client needs, no matter what country. To learn more about NAR and what it means to be a REALTOR®, visit www.realtor.org/whyirm. For consumer (buyer/seller) resources from NAR, visit www.houselogic.com. Some foreigners might believe that Costa Rica is a savage land. An image of a land lost in time with nothing but dirt roads, chickens running loose in the streets, and the local population traveling in ox carts. Old and colorful school buses or Land Rovers from the 1970s might arise in their minds if they have not been here before. The good thing is that this back-to-basics lifestyle of enjoying nature, driving through wonderful scenery to arrive at heavenly beaches, rainforests, or active volcanoes, coexists with a prosperous nation with a flourishing economy. Historically, the country´s economic center has been the central valley. Two decades ago, there were only two or three buildings with over 20 stories downtown; but, San José and its urban surroundings are nowadays a modern city in constant growth. A modern airport serves visitors and currently, in its skyline, you can see several construction cranes working on tall apartment buildings, office complexes, commercial centers, roads, etc. New suburbs have been created with housing available for the middle class, all the way up to the extravagantly rich who can buy mansions in the hills and in gated golf resorts. Around these new residential developments, services and amenities have inevitably been created. In districts like San Rafael de Escazú, Pozos de Santa Ana, San Antonio de Belén, and Pinares de Curridabat several new hotels of different brands have opened their doors in the past ten years. You´ll find in these areas dozens of restaurants, huge malls with all the fancy stores, dealerships for all the luxury car brands, mixed residential-commercial developments with hundreds of underground parking spaces, furniture stores, private schools, etc. The offering of goods and services is so extensive it can even be overwhelming. The recently built highway, Route 27, offers an escape from this urban jungle. During the daytime or at times of light traffic the distance between Tamarindo Beach and San José can be driven in less than four hours. 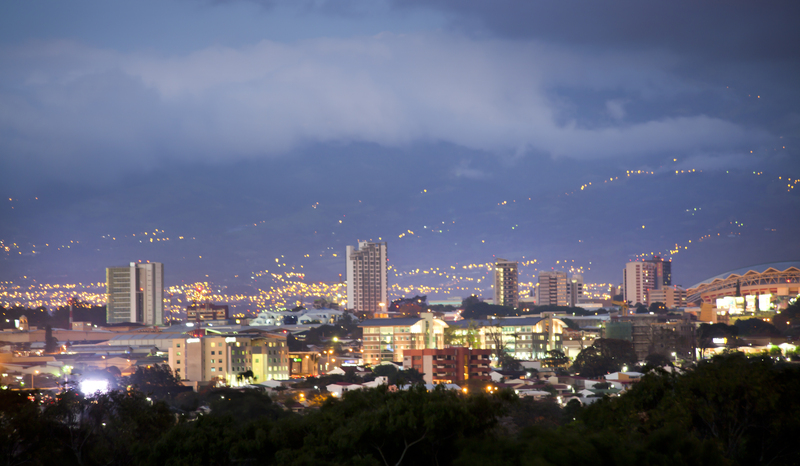 Daily flights between San José and Tamarindo are available and only take 45 minutes. So, making the choice to reside on the exuberant coast of our beautiful country does not mean you have to let go the pleasures of the modern capitalistic society.